Odd connections: with some big mountain bike action happening in Austria this weekend, and having just booked my hotel for Eurobike 2010 (well it’s still 4 months away but the time flies and i just realized its time to book the hotel otherwise I’ll be on a park bench or maybe in a corner of the Zeppelin hanger), I dug up this gem from 2006 Eurobike. This one from Kraftstoff, the “Ernesto”. I wish I had taken a closer look at the time. 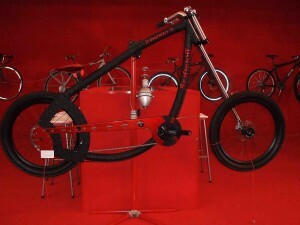 Nothing like a concept bike to attract attention. It sure got mine along with many others. 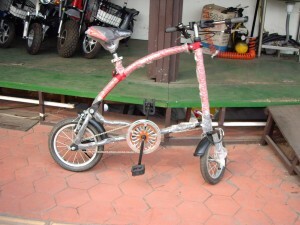 Top”tube”/seatstay in one; parabolic down”tube”/chainstay; asymmetrical fork and, apparently, asymmetrical “seat”stay. Paris-Roubaix cobbles would be tamed with this. Or you’d be just all too funked up to notice them. . .
Just down the track on the same row, there was this hometown electric offering. More practical, perhaps, but not quite the same effect. A precursor to the LEV storm that was about to break. Not to worry. I caught a working version–well, sort of version–of the Ernesto at a quaint little corner shop today heading home from the Sunday ride. Distant reflections of similar designs you see around when you dont have your camera handy. Just remove the bubble wrap and it’s time to commute. This was quite a cool shop. 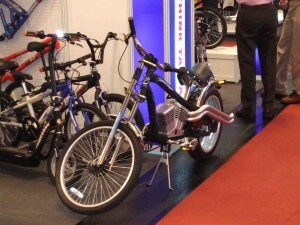 It mainly dealt in E-bikes of some sort or another. So this little pink number was the odd one out. 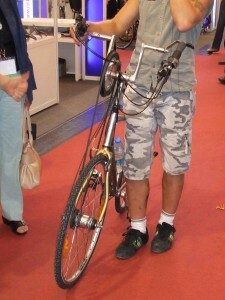 Returning to Eurobike 2006. If they dont come to you–go to them. This front-wheel drive beast (and standard rear drivetrain as well) driven by cranks where the handlebars usually go. The reaction of just the folks in view here were typical of this right through the pavilions; this guy was doing the rounds. Let’s have a closer look at the handlebar drive. It’s even got gears there, although I never had a good enough look at this in motion. Yep, shoulda taken a movie of it! I do recall the motion being an acquired art. The sort of skill you’d have had to master the late 19th century’s high-wheelers. And, no, he didn’t make it look easy at all! In a way it harks back to a brief tussle between front and rear wheel chain drives in the mid-1880s, that the safety Rover won emphatically. This patent application may be the one in the frame here. 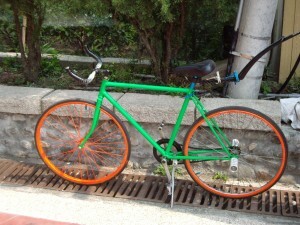 You’ve probably heard that fixies were in the ascendancy at this year’s Taipei International Cycle Show. Maybe there’s nothing new under the sun. Things go out; they come back in. But not quite the same. On today’s ride I came across one that’s been around forever. Casually parked next to a shack where it’s owner was passing some time. Tail fender up. Ears up. Ready for business. And of course, mandatory rear hub footstays for transporting (girl) friends. Chain could be tightened up a bit though. I could imagine this pure beast spitting a wad of masticated betel nut in the general direction of any fixie of recent manufacture. It would mutter, with no attempt to conceal derision: “I’ve seen it all kid. Get back t’where ya came from”.